It's been a busy old week, but I'm safely back in Cornwall! It's great to be back in Falmouth, where I'll be venturing into my second year of a degree in Conservation Biology with the University of Exeter. I arrived in Falmouth somewhat dazed after the typical 12-hour train journey from North Wales, which is nevertheless a very scenic ride for the first five hours! 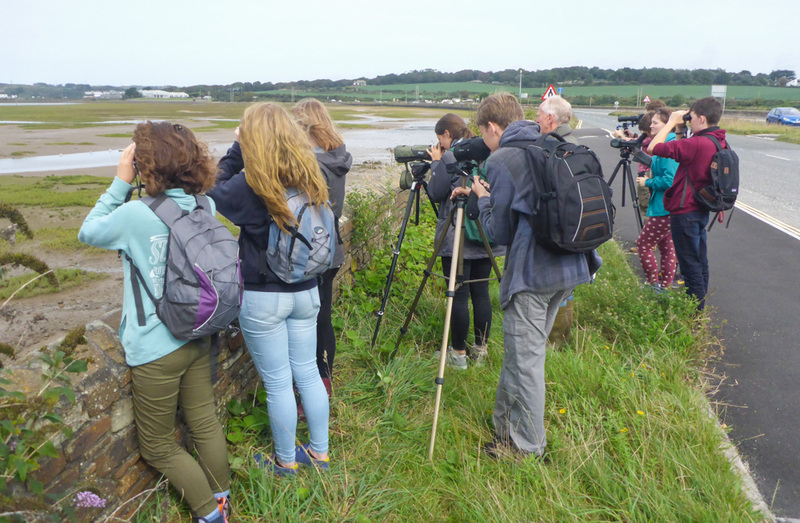 I spent the following days settling down and running various trips and events with 'ecosoc' (the ecological society on campus) for freshers week: birding trips around the county, moth trapping, bird ringing etc. It has been great to see all the new and enthusiastic students arriving for their various degrees, and also to get out an about around this stunning area of the country! Maenporth at sunrise, which is around 15 minutes away from where I'm currently staying. A home from home! 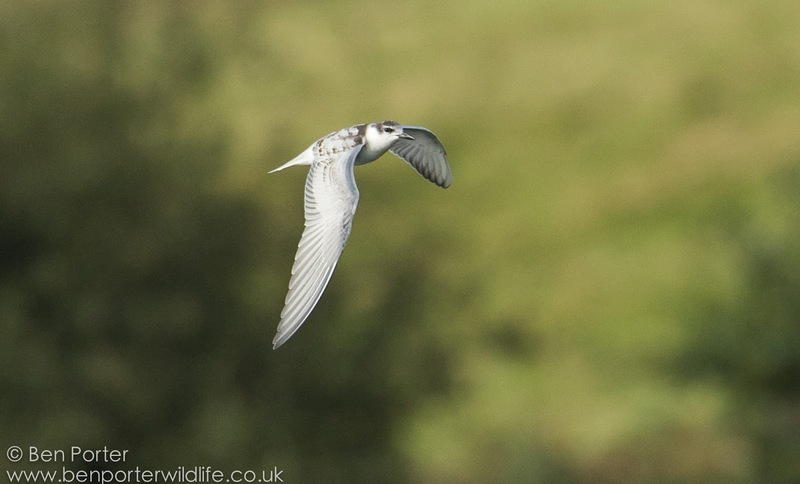 At the end of my first day, I decided to pay my local patch a visit - namely that of Argal and College Reservoirs just a few minutes from my caravan. 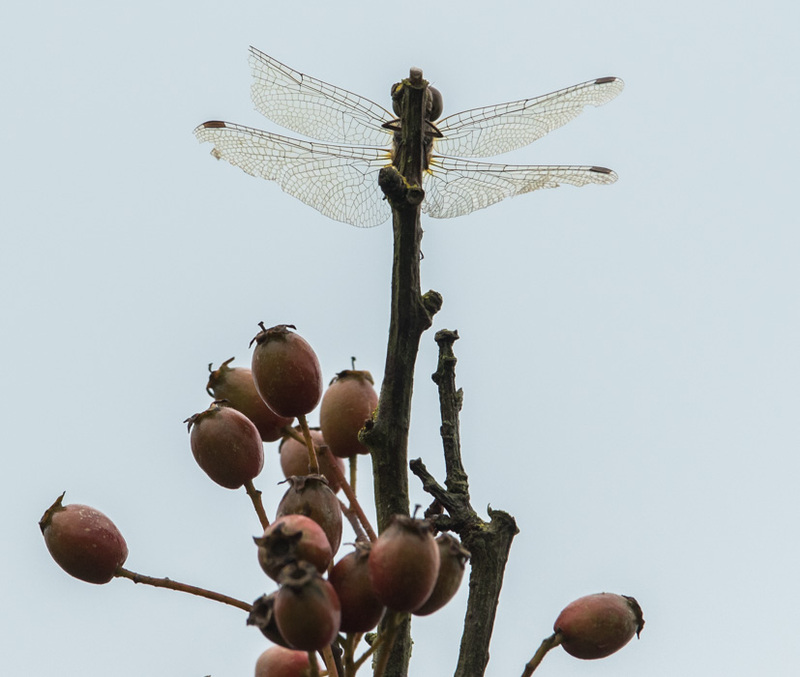 It was getting a little dark at 7pm, but as soon as I arrived at the reservoir I saw this lively chap fluttering around and plunge-diving for fish. 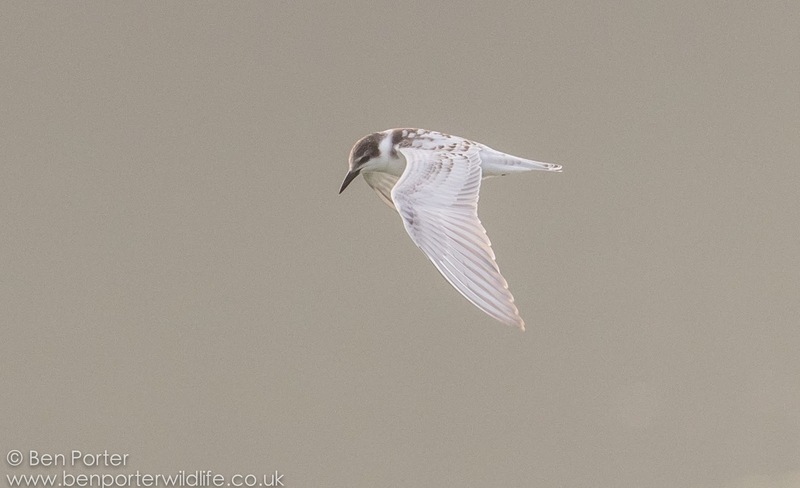 I will be writing a full blog post about the find, but I basically screwed up (thinking it was a juv black tern) before being corrected that it was in fact a WHISKERED TERN! 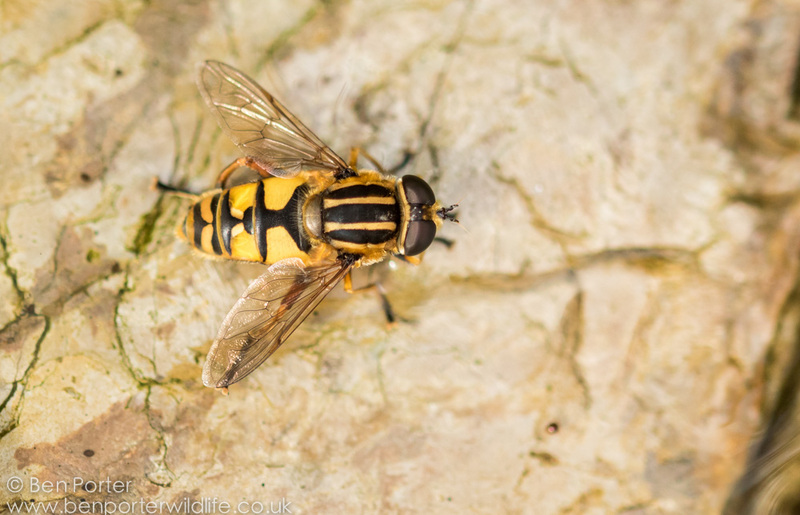 Thankfully it was present the next day, and showed brilliantly up until the 15th (no sign for the last few days). 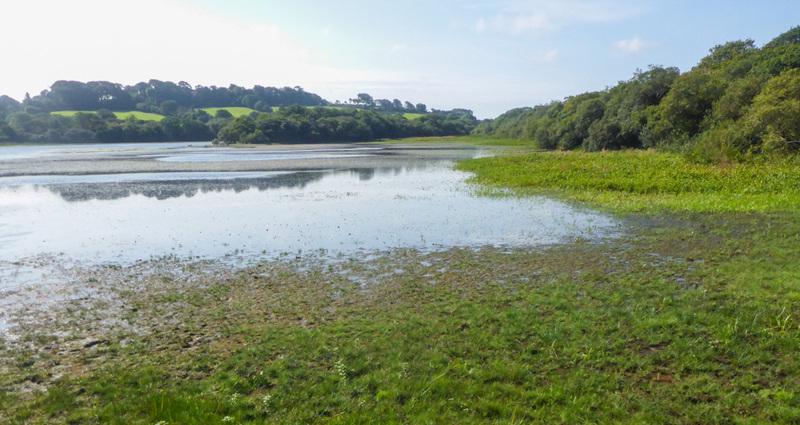 The water level in College and Argal Reservoir is incredibly low, which means that a lot of vegetation has sprung up around the perimeter and a muddy bank has been exposed. 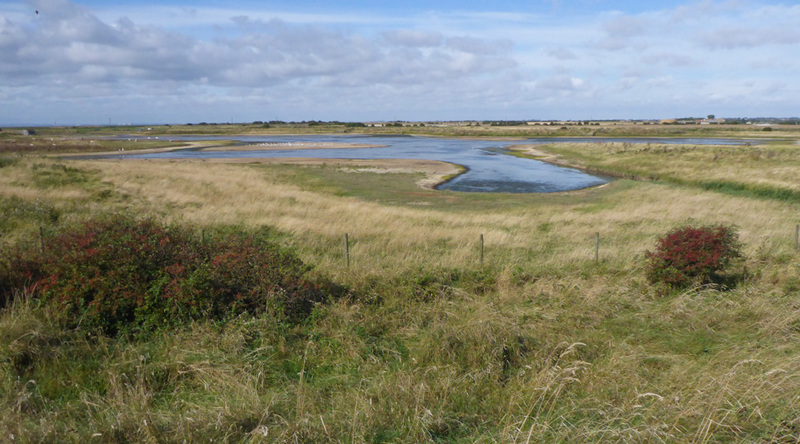 I have to say that the habitat is looking better than ever for waders and ducks, so I look forward to seeing what it will produce this autumn and winter. 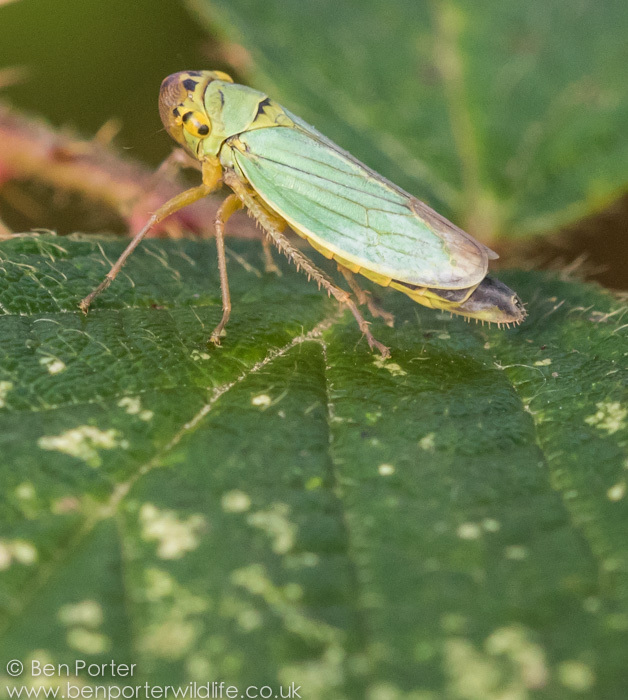 Froghopper sp. - not sure what species? Bissoe has some perfect grounds to play host to some huge gatherings of Ivy Mining Bees (Colletes hederae). They construct their nests in tunnels in the sandy ground, and can number in the tens of thousands in some places in the UK! 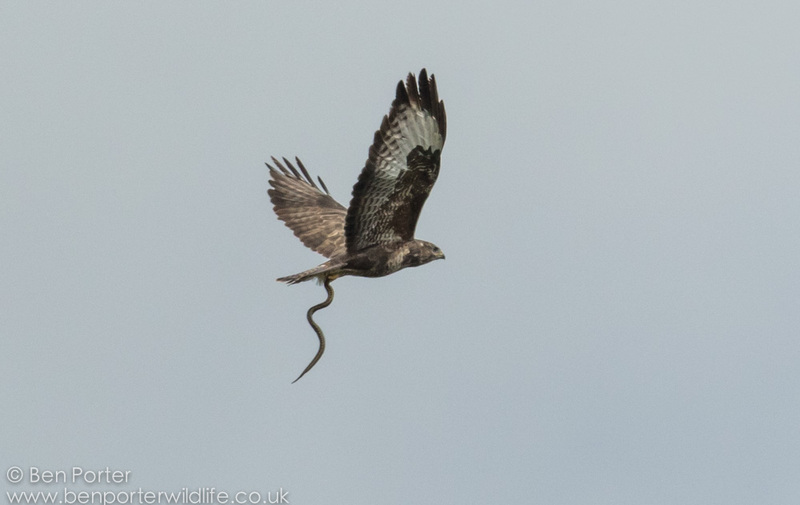 The highlight of the day for me was seeing this Common Buzzard fly over with an Adder gripped firmly in its talons! 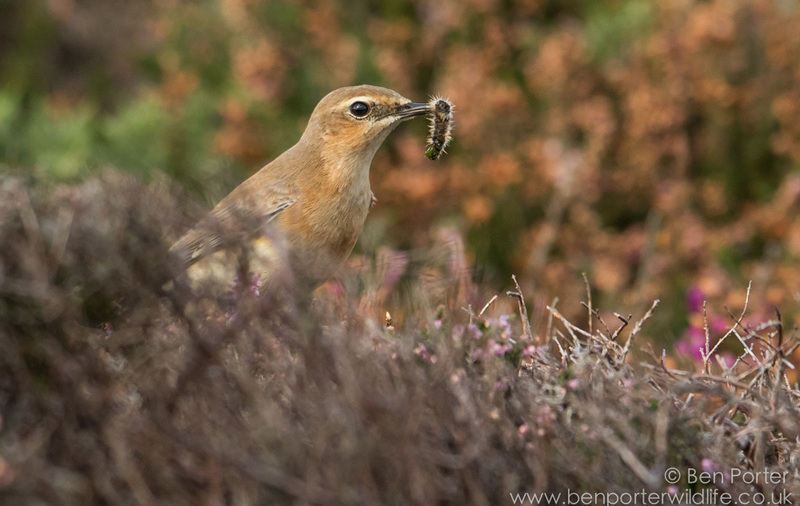 An amazing sight, especially when another Buzzard was in pursuit giving whistling calls in attempt to pinch a little of this rather sizeable snack. 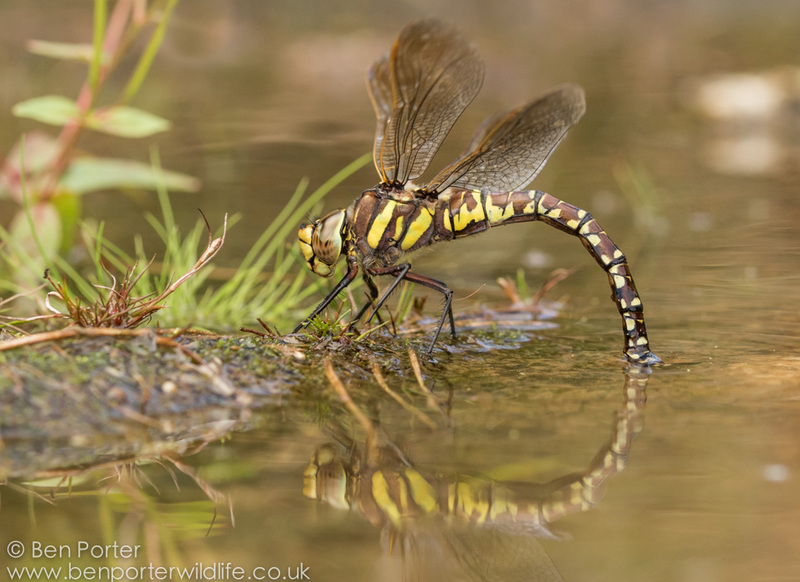 Only my second UK adder, and in the talons of a Buzzard! 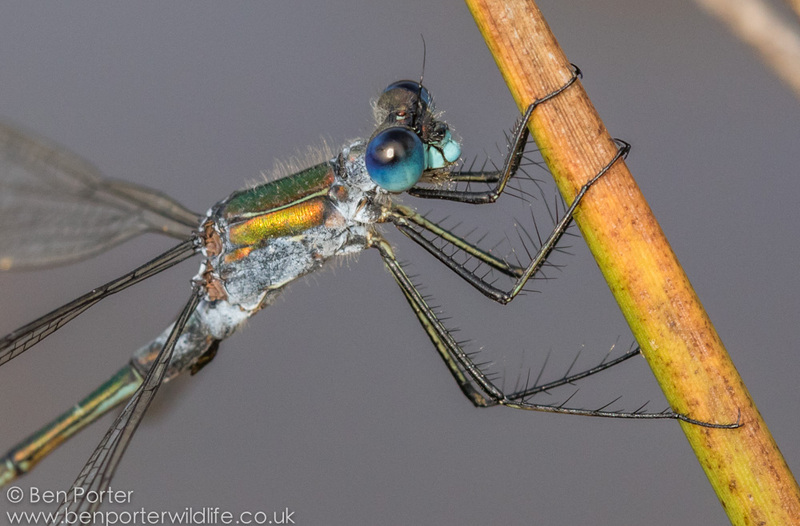 My course begins in earnest this week, but I hope to get out and about as much as possible - I will endeavour to keep my blog updated in the coming weeks, but we'll see how the workload pans out! After a superb August on Bardsey, I left the island on Wednesday ahead of a period of stormy weather, and made my way to the east coast of England via a series of buses and trains. The purpose? 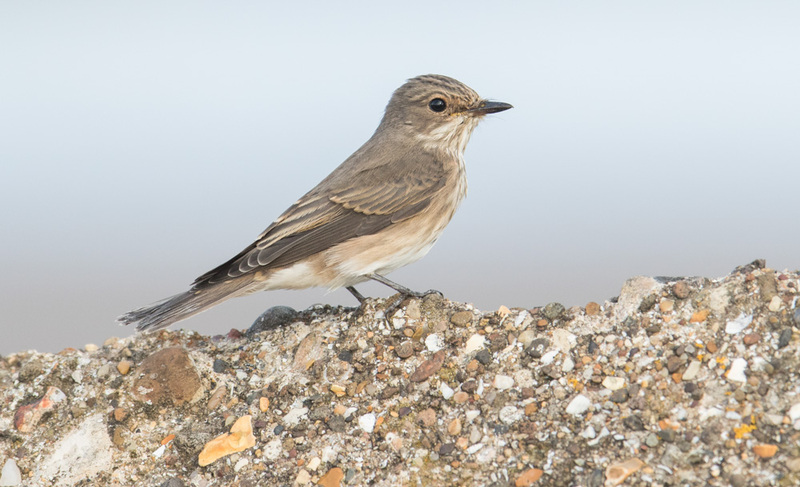 The primary reason for my short-distance migration was in fact to take part in an event focussing on migrations of a much larger scale: I was making my first visit to the superb Spurn head in East Yorkshire to attend this year's Migfest. 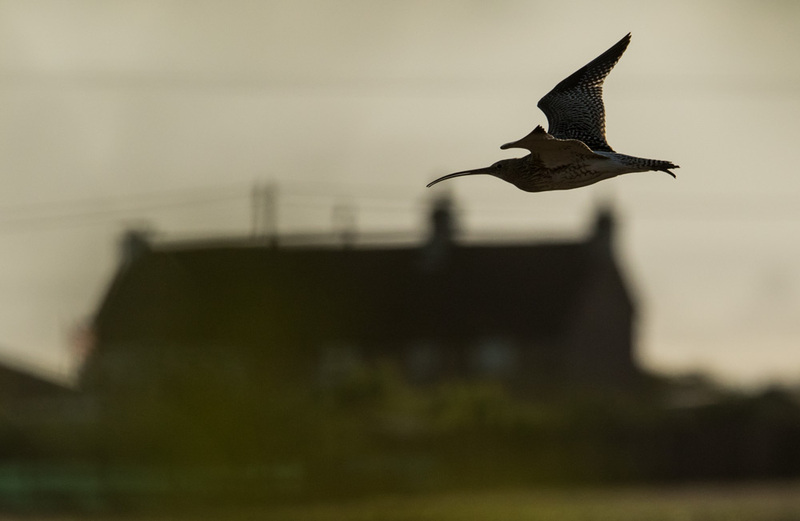 In September every year, Spurn Bird Observatory plays host to a gathering of birders from all over the country - and even further afield - to come and witness the spectacle of migration at one of the UK's best hotspots for this exciting movement. 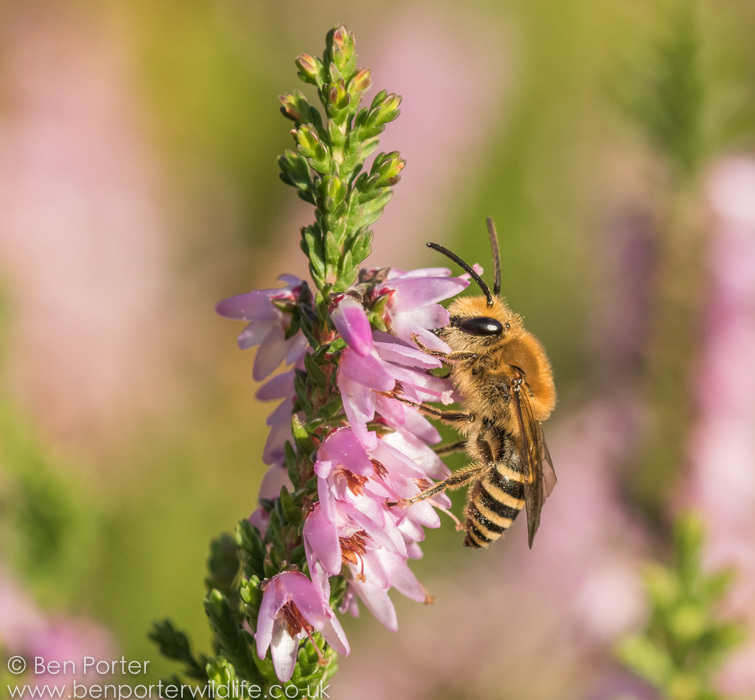 The 'Migfest' weekend event includes guided walks, ringing demonstrations, moth trapping and a series of interesting talks from a range of different speakers (this year, including David La Puma from Cape May Bird Observatory and Björn Malmhagen from Falsterbo Bird Observatory). 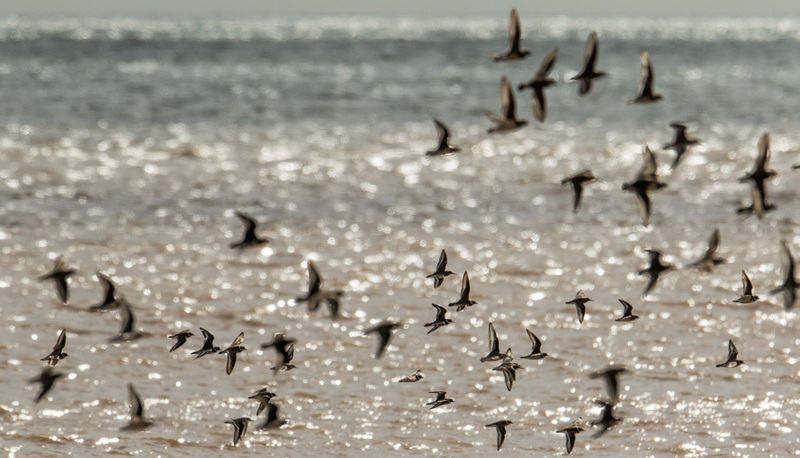 But aside this, the main focus of migfest is the birds: getting out there and witnessing hundreds of migrants passing by out to sea, whizzing south overhead in flocks or gathering in their thousands along the foreshore as the tide forces waders from their feeding spots. 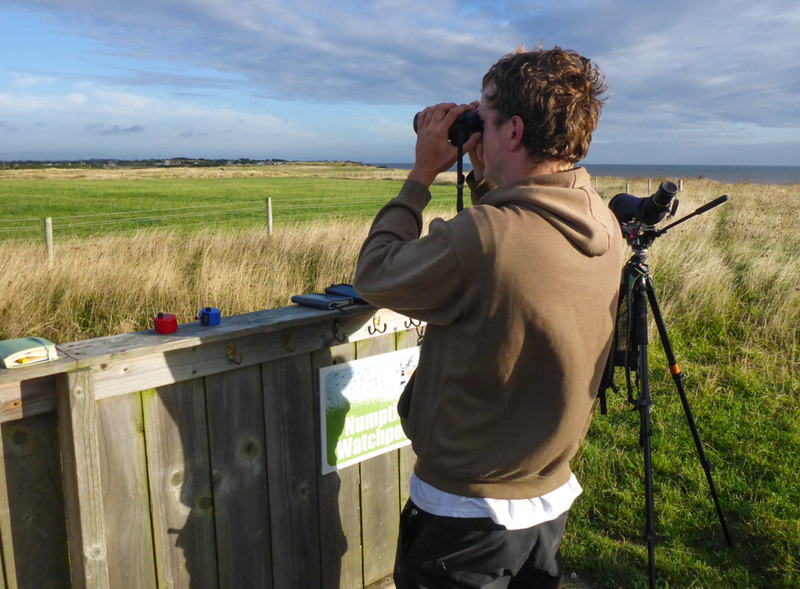 I arrived at Spurn after a day's travelling on Thursday evening, and it was great to meet up with young spurn-based birders Tim Jones, Jonnie Fisk and Daniel Branch, who were helping out with the running of the event. On Friday morning I awoke bright and early - the weather was clear and breezy. Not ideal for ringing (too windy for using mist nets), but the south-westerly head wind encouraged a steady passage of migrants overhead, and gave me a great introduction to 'vis-migging' (watching visible migration) on the Warren and the New Narrows (where the mainland tapers off to a fine point before the spit juts out to sea). 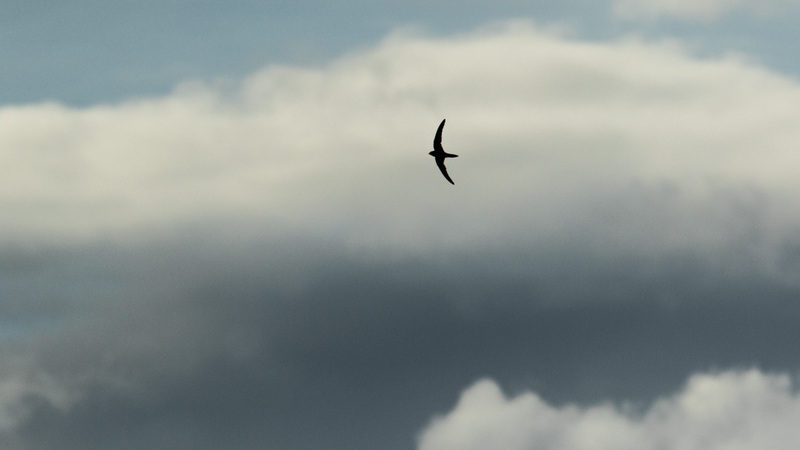 We recorded some great numbers over the course of a few hours, the final tallies including 800+ Swallows, 1000+ Meadow Pipits, 50 Linnets, 160 Tree Sparrows, 20 Grey Wagtails, 60 House Martins, 30 Sand Martins, 20 Yellow Wagtails and 2 Greenfinches. a steady overhead passage of Meadow Pipits resulted in 1000+ counts on Friday morning, accompanied by tight undulating flocks of Tree Sparrows. 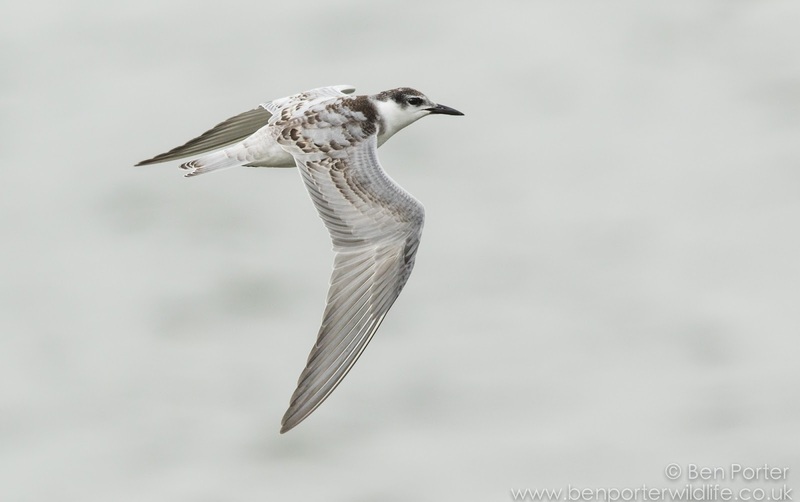 Besides the overhead passage, the nearby seawatching hide was a great place to be too: seabirds and waders were flying south and north throughout the morning, and as the wind became increasingly storng during the day, some smart species were recoded. 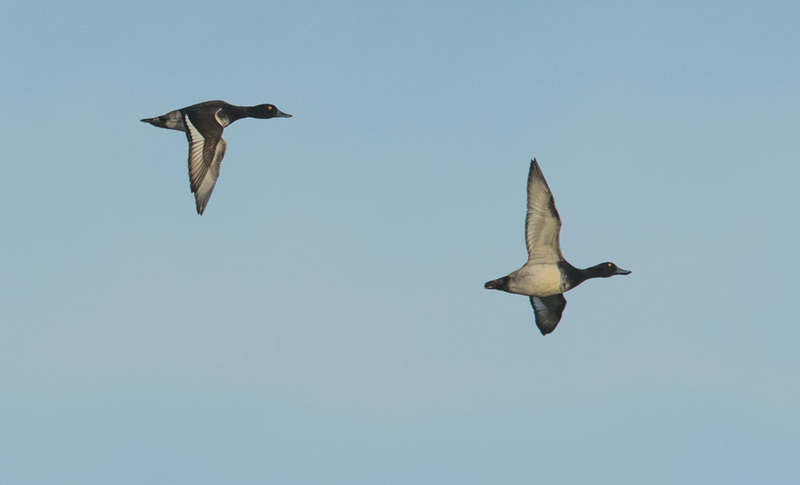 In the morning, highlights included 15 Sandwich Terns, 3 Manx Shearwaters, 11 Red-throated Divers, 15 Cormorants, plus plenty of Wigeons and Common Scoters. 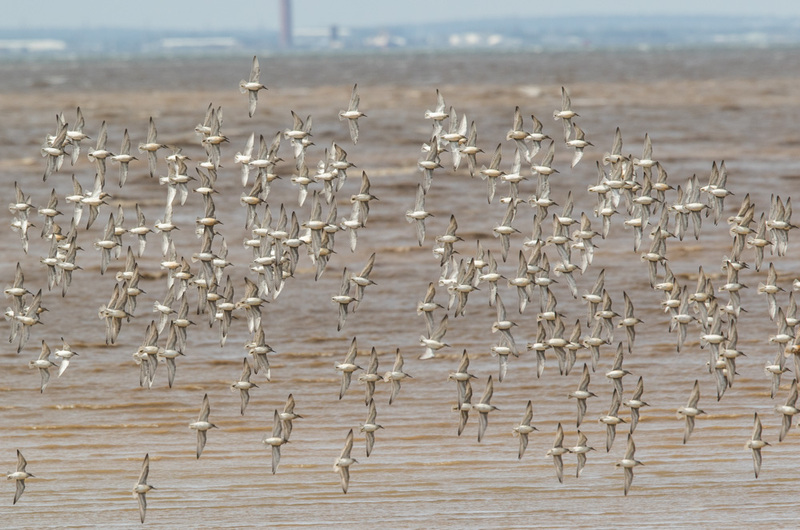 The twice-daily exposing of Humber's rich estuarine shores results in huge numbers of wintering and passage waders, which make use of the mudflat's feeding potential. 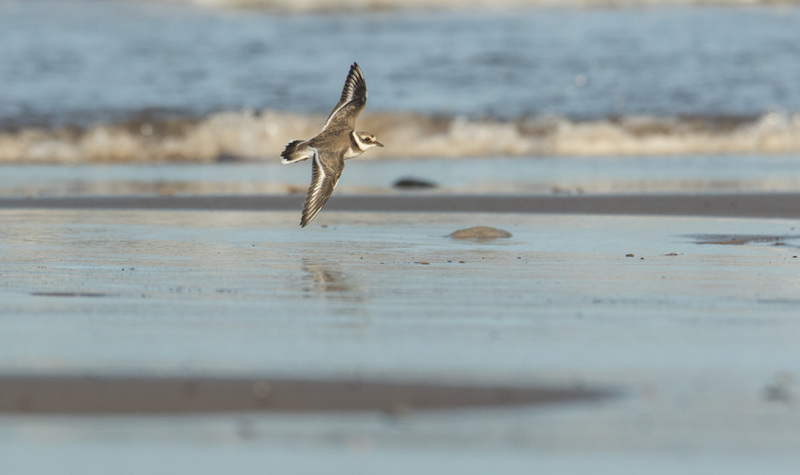 During my stay at Spurn, there were several thousand Knots and many hundred Golden Plovers commuting between inland scrapes and the mudflats every day. 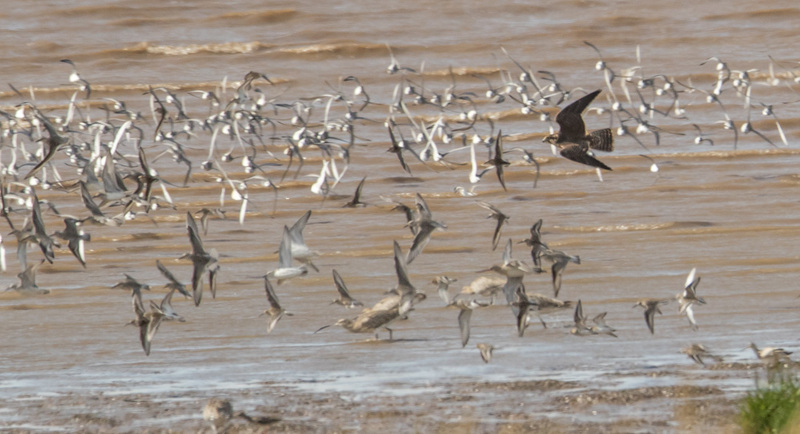 Amongst the throng of pulsating calidrid flocks were Curlew Sandpipers, Curlews, Ringed Plovers, Dunlins, Redshanks, Sanderlings, Black-tailed and Bar-tailed Godwits and Ruffs. 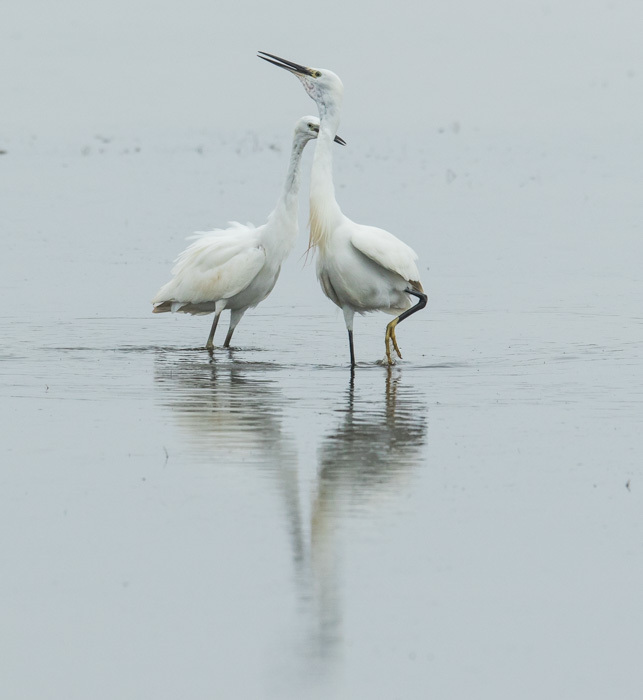 In winter, the numbers can surpass six-figure counts - now that must be an epic sight! 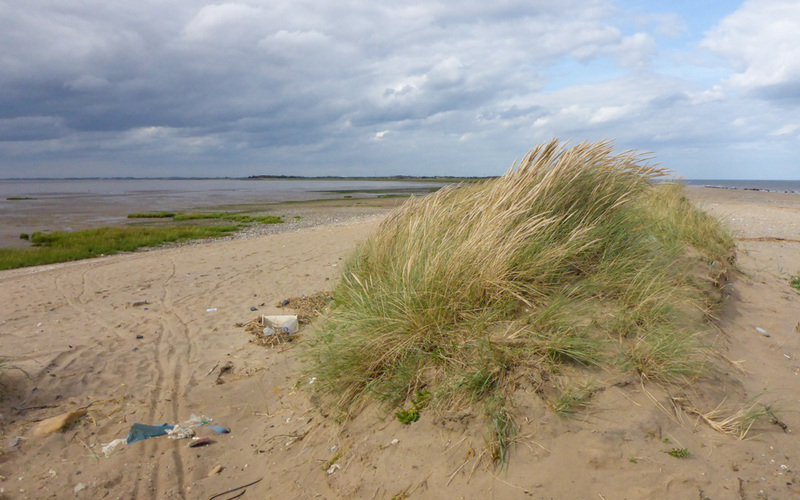 I spent most of the first day wandering around and exploring the various habitats and sites that Spurn has to offer: The Point (right on the end of a 3-mile spit), The Warren (the sort of funnel before the spit, where migrants are squeezed to a point before crossing the north sea), Kilnsea wetlands and Beacon Ponds (a series of inland scrapes and tidal lagoons), and countless patches of reed beds, scrubland and stubble fields. It was great to meet up with fellow young birders who had likewise made the trip to join the event: Matt Bruce and Beth Aucott, Espen Quinto-Assman and Oli Simms. 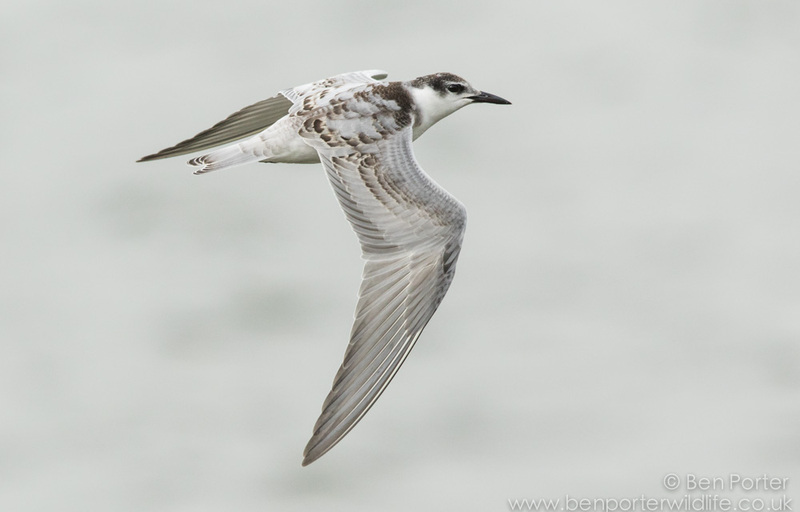 We spent the afternoon searching the coast for migrants and scanning the sea for passing terns and gulls, which included over 200 Common Terns blasting south accompanied by two Black Terns and three Little Terns, along with three Arctic Skuas, 10 Mediterranean Gulls, a Red-throated Diver and, perhaps most surprisingly, a distant Marsh Harrier! 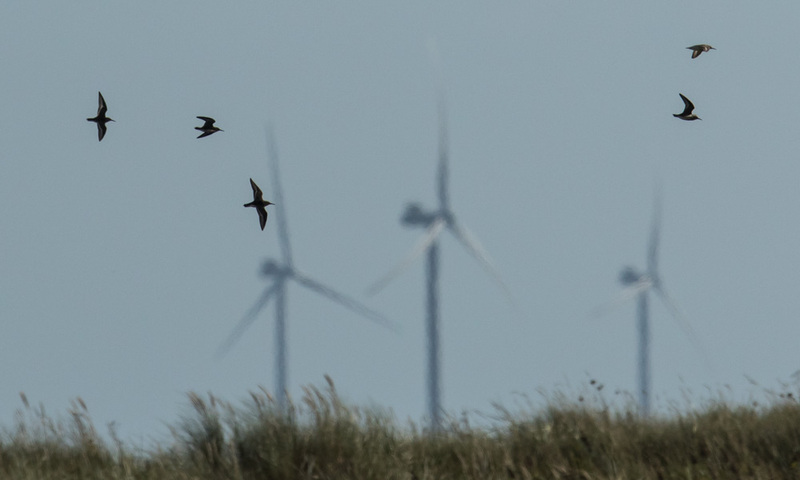 A late Common Swift shearing southward along the dunes of the point was great to see - surely no trip to Spurn is complete without seeing its most famed species? 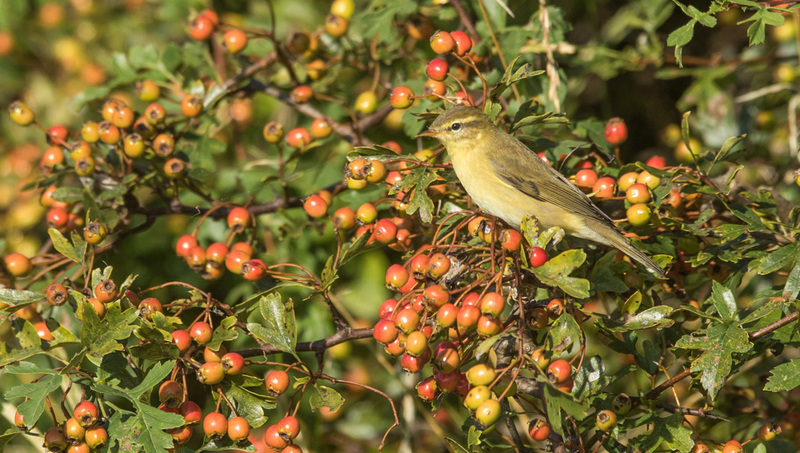 There were a few migrants to be seen in the mixed scrub in sheltered areas, including a lone Spotted Flycatcher, Willow Warblers, Whitethroats and Whinchats. 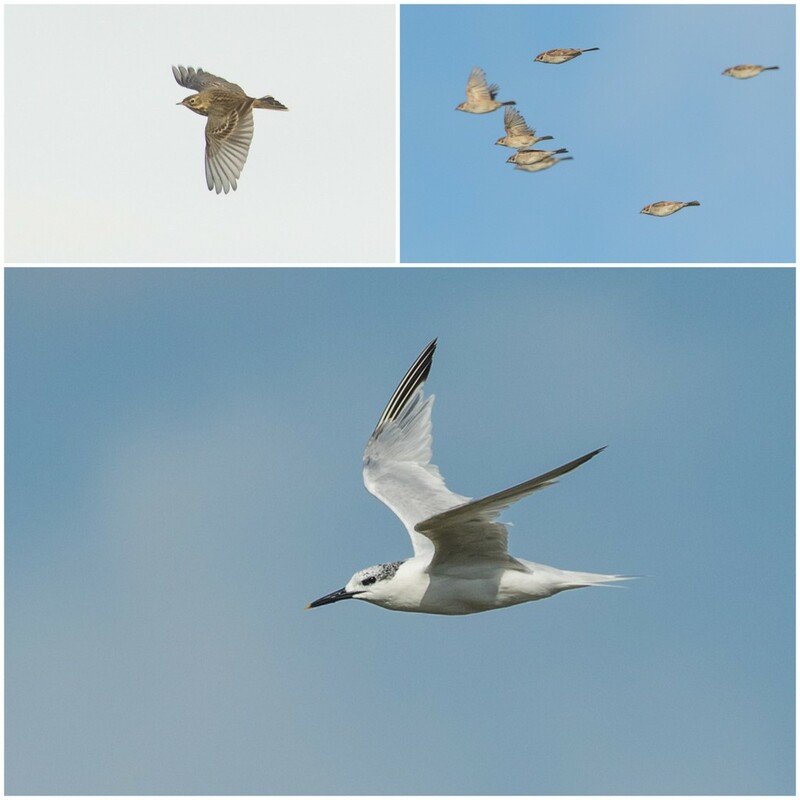 After a full day in the field, Friday evening saw the official launch of migfest 2016, with a speech by Andy Clements of the BTO and then an interesting talk on the concept of 'Reverse Migration' by John Beaumont from Flamborough Bird Observatory. My first day at spurn was rounded off nicely by catching up with some old friends and new faces over some hot cheese & onion pies, followed by a drink in the Crown and Anchor. 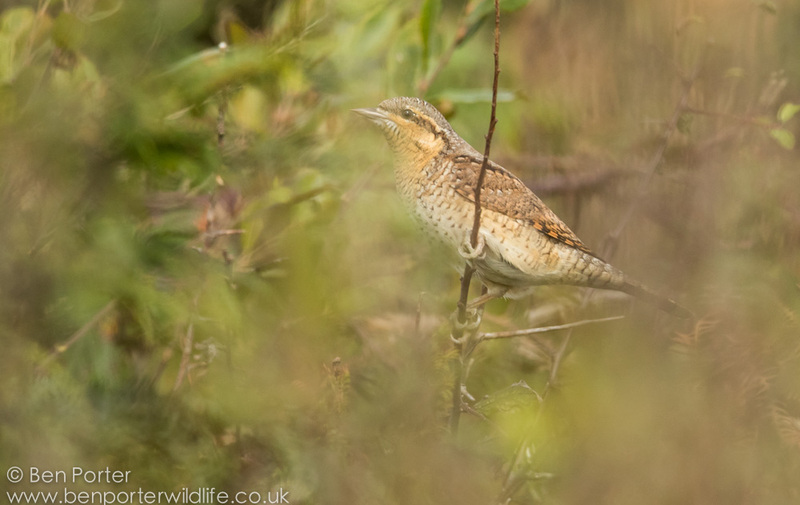 Saturday dawned calm and drizzly - not the sort of conditions that immediately spur one to jump out of bed at 6am, but myself and Will Langdon headed out nonetheless, with the hope that the conditions may have brought a few birds to ground. 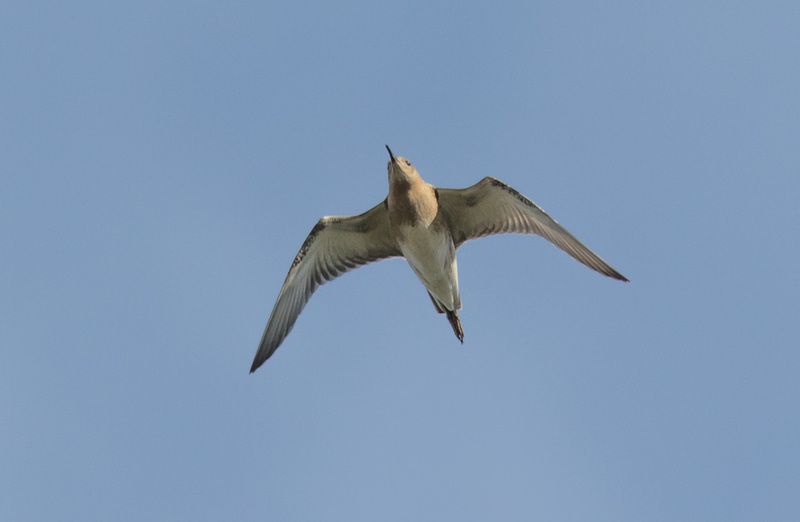 We walked along the edge of the 'triangle', where a handful of new arrivals presented themselves in the form of five Reed Warblers, nine Whinchats, five Sedge Warblers, a couple of Willow Warblers and some Swallows passing overhead. 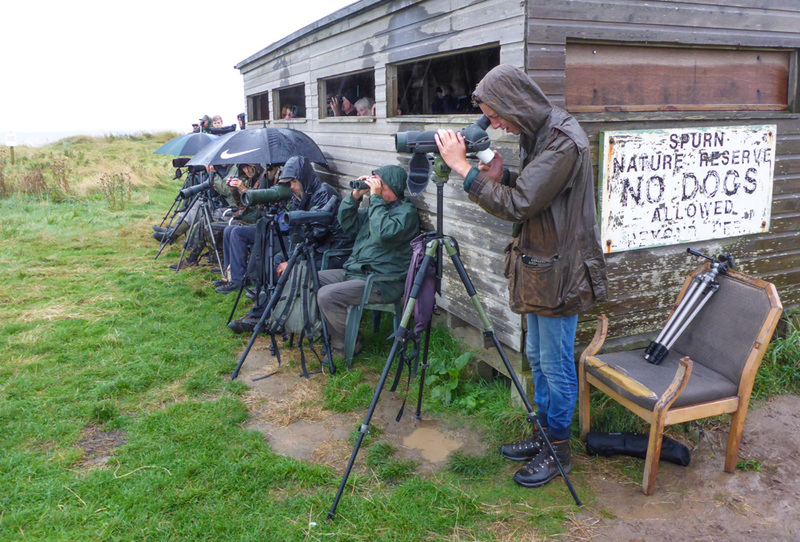 We made our way to the Warren, where a fair gathering of folk had been seawatching (or at least trying to in the persistent rain) for the last half-hour. We joined the group, becoming increasingly drenched as the precipitation continued unabated. 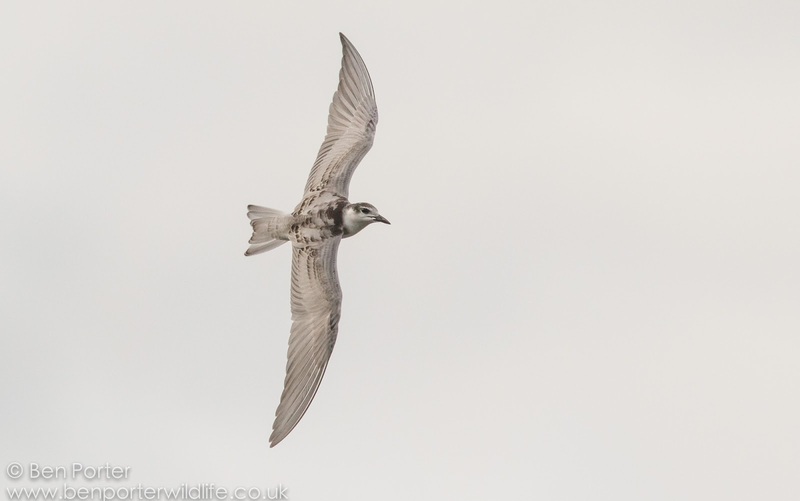 There was just enough clarity to lock onto passing seabirds, and we collectively recorded 12 Red-throated Divers, two Manx Shearwaters, an Eider, 60+ Common Terns, a couple of Arctic Terns, 25 Sandwich Terns, 5 Mediterranean Gulls, 50+ Common Scoters, a handful of Teals and a few Gannets. 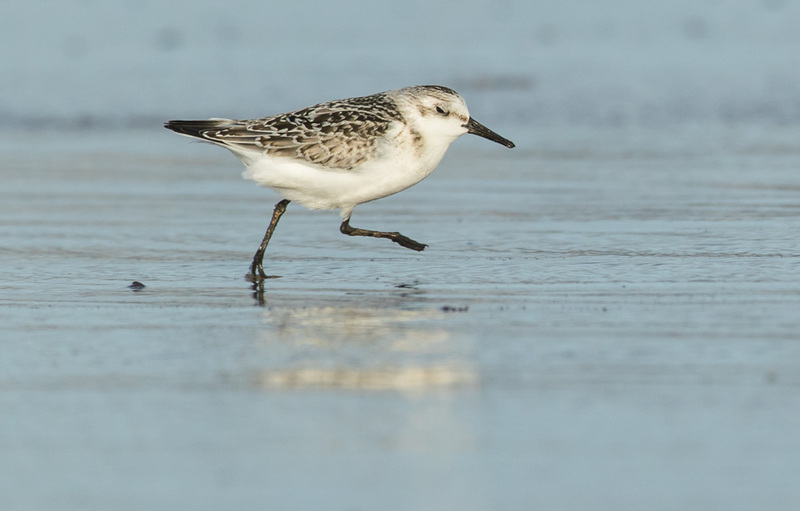 At around 8am, news came over the radio of a Kentish Plover showing on the sand bank near sammy's point - a rapid exodus of the hide and seawatching party saw cars and people bomb off to see this scarce visitor - the first at Spurn since 2000. 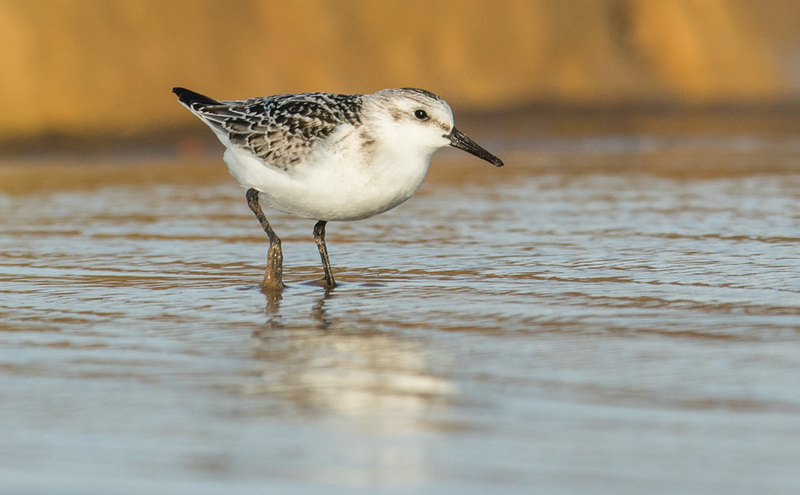 Unfortunately the bird had scarpered, and wasn't picked up again for a couple of hours, when it turned up in Kilnsea wetlands. 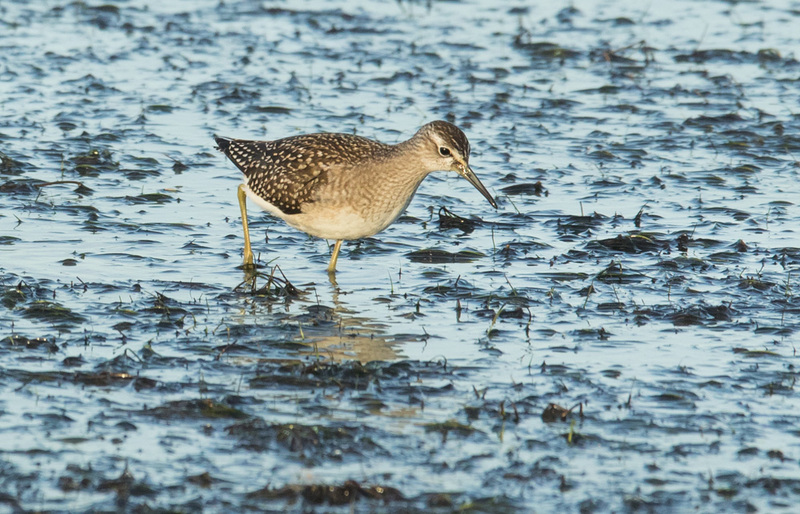 I managed to catch up with the bird here, where it showed well on the scrape alongside the superb Wood Sandpiper, Little Egrets, Mediterranean Gulls and a handful of calidrid waders. 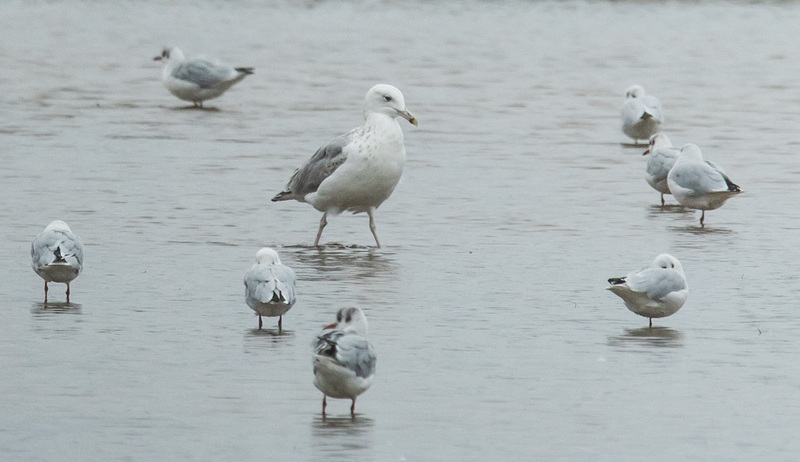 A superb surprise was when a 3rd winter Caspian Gull dropped in - my first ever sighting of this subtly smart species, and one which I've been hoping to find back in Wales for a while (although they are a scarce bird in wales, with fewer than 3 records!). The rest of the morning was spent looking for new arrivals amongst the sodden hawthorn bushes - this produced a couple of Lesser Whitethroats, two Common Whitethroats, a couple of blackcaps and a handful of Willow Warblers - and also popping in to the main migfest hub to catch up with more birders and friends who had arrived and were taking a look at the various stalls - featuring organisations like Waderquest and the BTO, through to artwork from the likes of Darren Woodhead and Richard Thewlis. 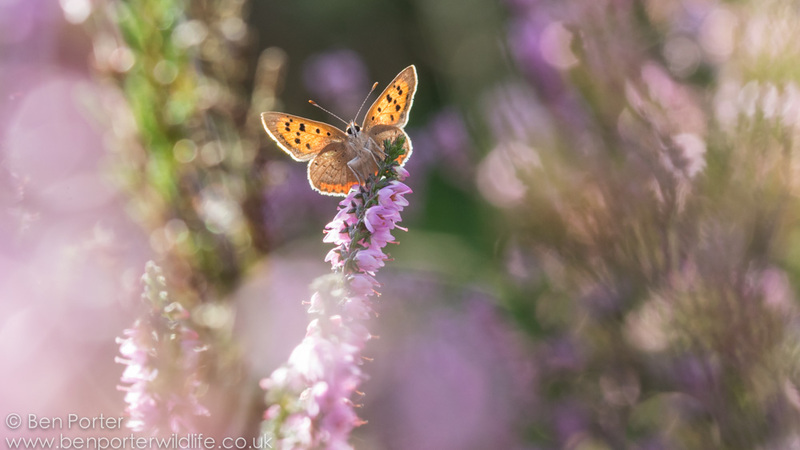 It was good to get away from the rain and warm up at intervals, but there was also plenty to be seen out in the field, and it was definitely a very enjoyable morning. 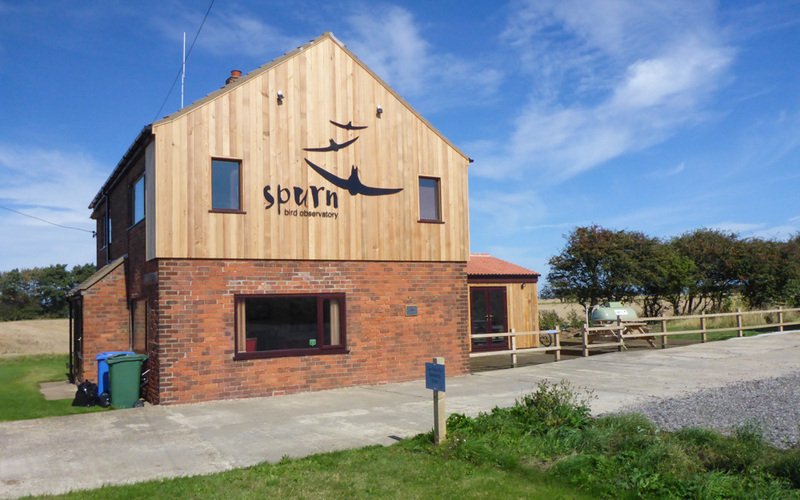 I had to head off at lunch-time on the Saturday, with a train to catch to Falmouth on Monday, so said goodbye to the brilliant team at Spurn Bird Observatory, and adios to a brilliant migration hotspot which I'll surely return to before too long. A big thanks to everyone for a great event and some good birds. 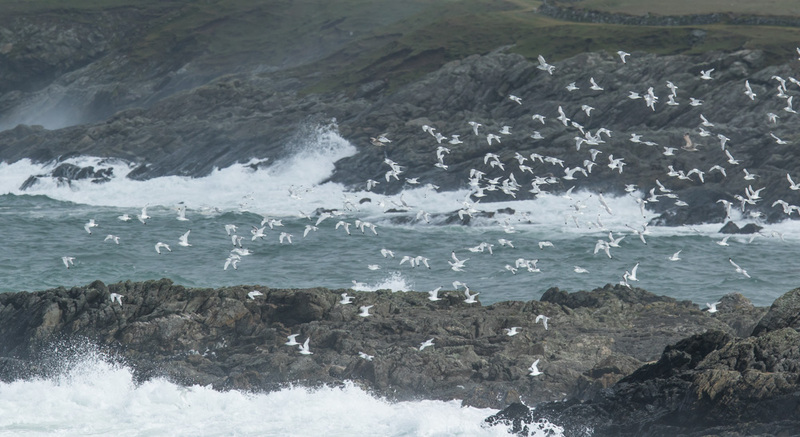 This summer has seen an incredible influx of Kittiwakes to the coast around Bardsey, with flocks numbering into triple figure counts frequently alighting into the air like snowflakes! 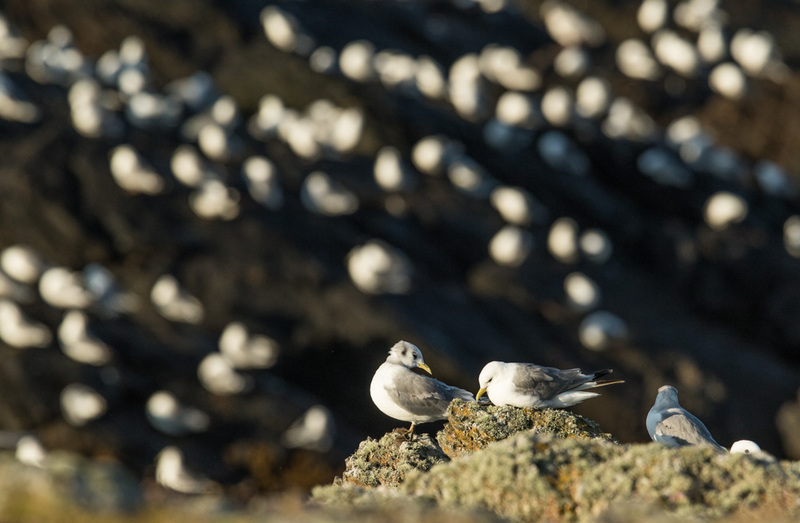 Here on the island, we often have flocks of mixed adult and juvenile Kittiwakes lounging around the coast in July and August, often settling on particular stretches of the shore. However, this year has seen consistent high numbers from around 20th July through to the end of August. Some of our highest counts have included 3266 on 21st August, 2100 on 31st August and 2000 on both 25th and 27th. Although these mega counts have been amazing, it is more the consistent daily gatherings of 600+ that have made for an impressive sight throughout August - significantly higher numbers than previous years. On the occasions when myself or staff from Bardsey Bird Observatory have been close enough to a settled flock to see, it has been really cool to pick out plenty of colour-ringed birds amongst them. 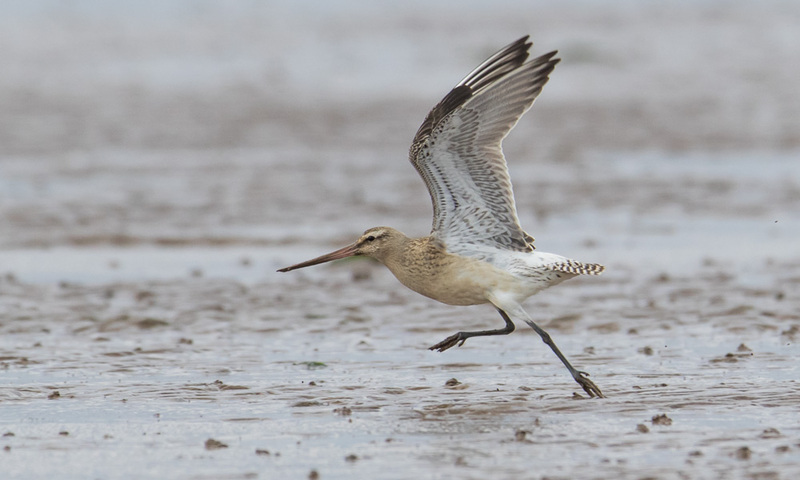 Looking out for colour-ringed birds is a great way of contributing meaningful data to some interesting projects, and is particularly productive in estuaries with bird families like waders and gulls. 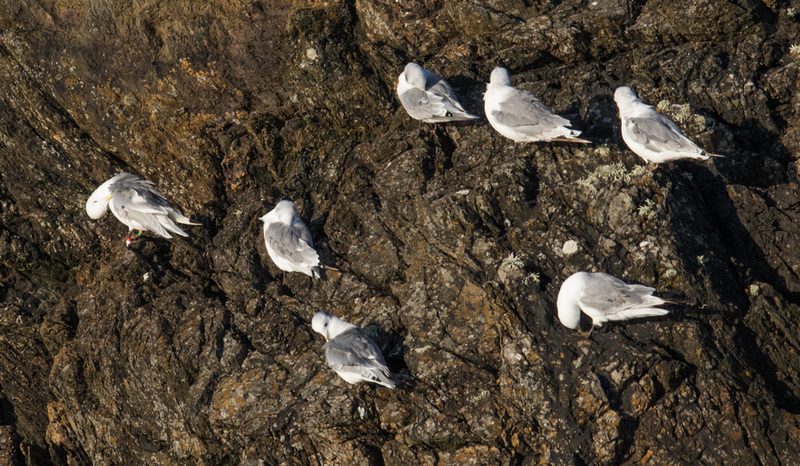 On Bardsey, we don't tend to get a huge number of colour-ringed birds coming through, so it has been great to obtain combinations of around 10 Kittiwakes from the big flocks that have been loitering around the coast. A quick search on the excellent 'cr-birding' website lead me to the scheme responsible for ringing the colour-ringed birds. You can work out who to email via a number of different details, such as which leg the metal ring is on, how many colour rings there are, whether any of the rings are coded (as in Darvic rings, which often have 3 or 4 letter codes), and also which colours are used. 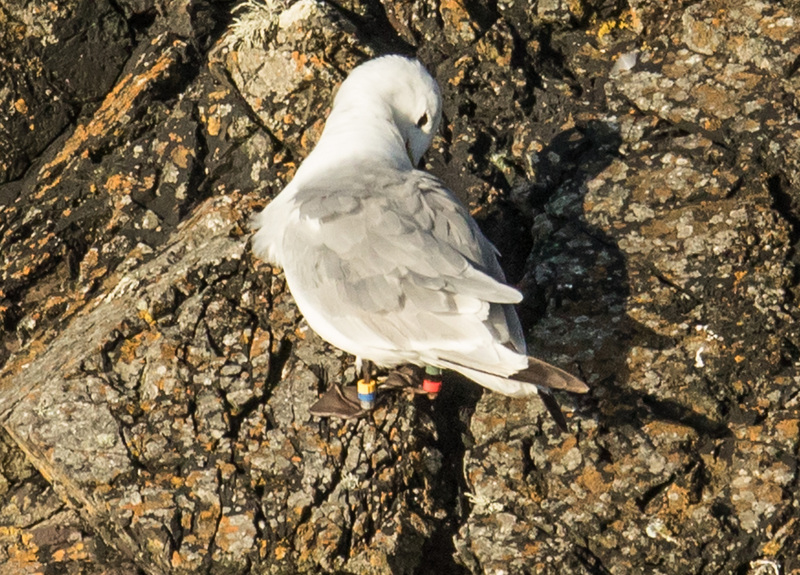 It turned out that all the colour-ringed Kittiwakes were from the same project, based in western France. I emailed the person carrying out the project, and was pleased to get a rapid response detailing all the facts relating to 'our' birds. I have included the shortened 'fact files' below for a few of the Kittiwakes, but basically all of the birds had come from France's largest black-legged Kittiwake breeding colony in Pointe du Raz (see map for details). 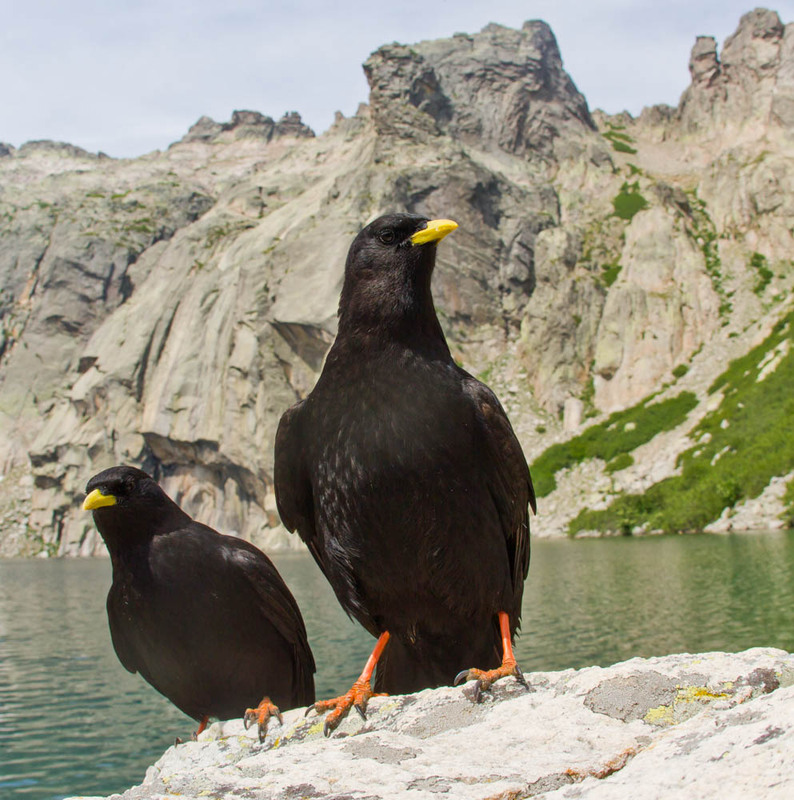 As the ringing scheme has been operational for over 10 years now, with hundreds of birds ringed, one could assume that a fair proportion of the birds in our monster flock have originated from this colony. 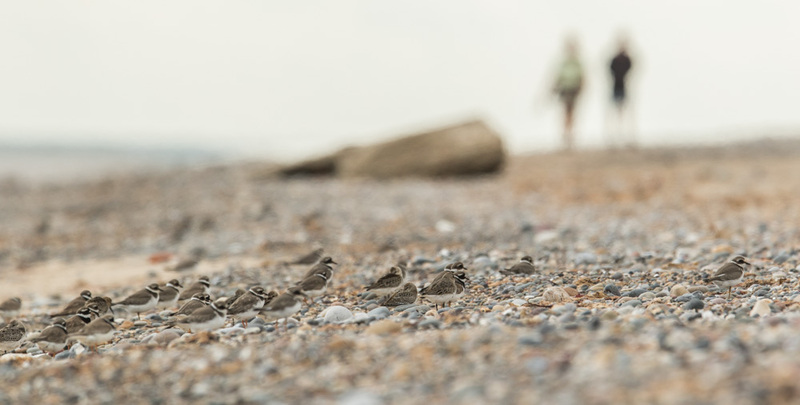 This is pretty interesting, as you would otherwise be tempted to think that the flock was simply formed of birds gathered from our own breeding colony, or perhaps colonies further up the Welsh coast. Born in pointe du Raz (Plogoff, Brittany, France) in 2009. First resighted in the study area in 2011. 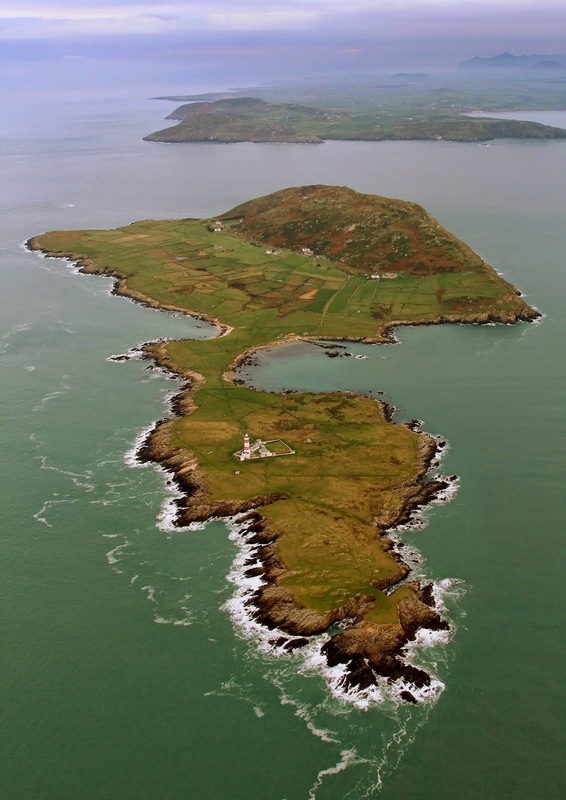 Looking at the details here, it is really interesting to see the time frame within which the birds have left their colonies and travelled up to Bardsey - many within a month, some within a couple of weeks (maximum). It would be interesting to find out whether the whole flock was comprised of birds from these french colonies, or whether there is a mix from several different populations. 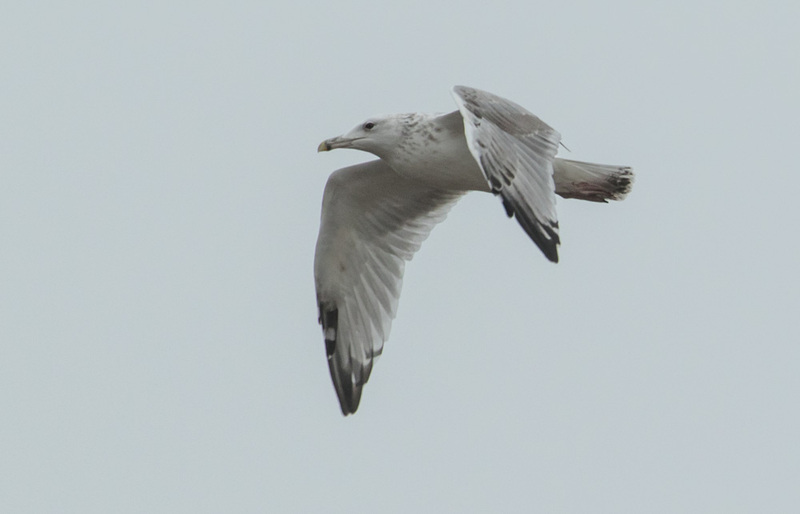 Kittiwake in active wing moult - another interesting feature of many of the birds in the flock. 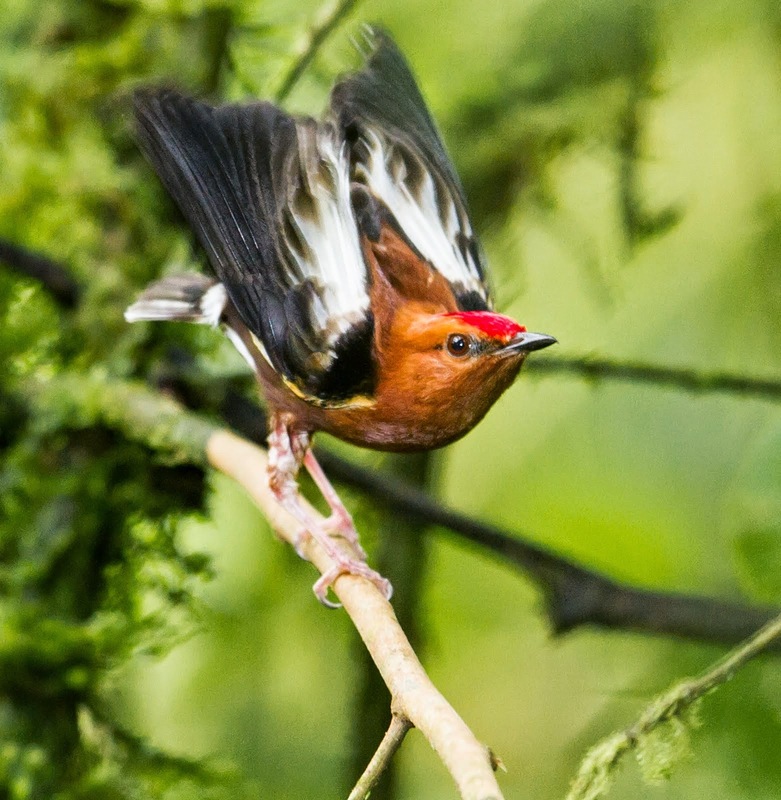 A lot of the birds have been carrying out their annual moult, renewing their worn primaries with fresh feathers. 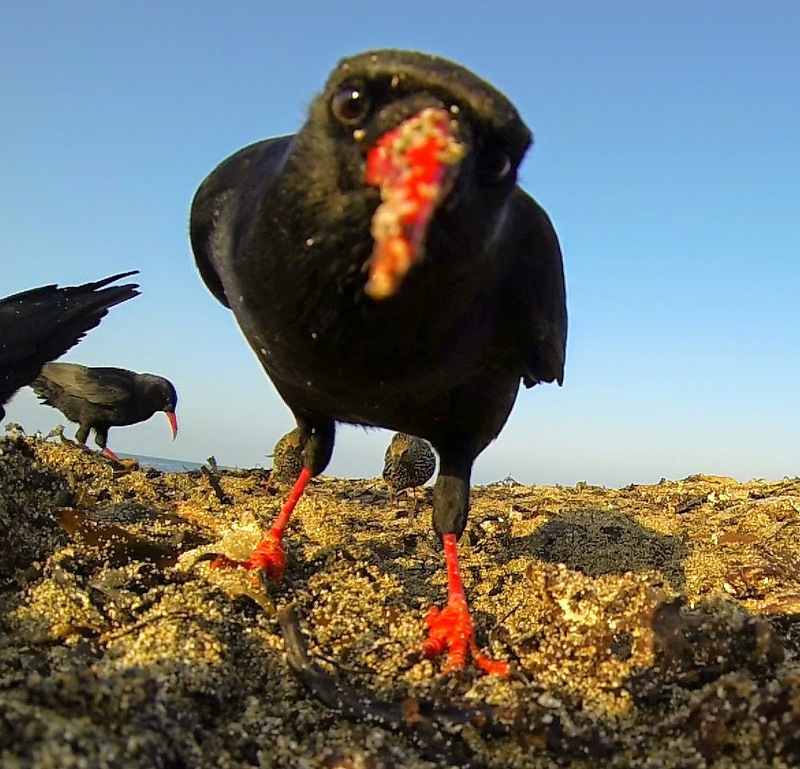 Growing new feathers takes a lot of energy demand, so perhaps these birds have been finding rich feeding around the island, which is facilitating their annual moult? There are plenty of questions to ask! 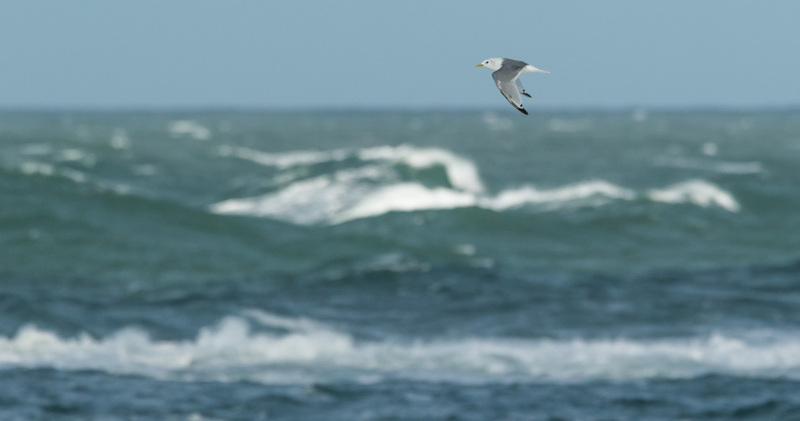 Kittiwakes are such a charismatic coastal seabird, whose wailing calls epitomises the sea for me. 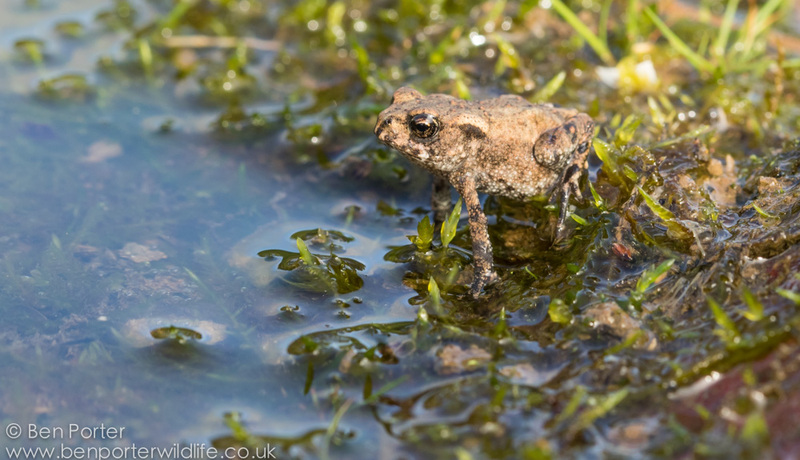 Unfortunately, this species is experiencing worrying declines across much of its range, particularly in large northern colonies. 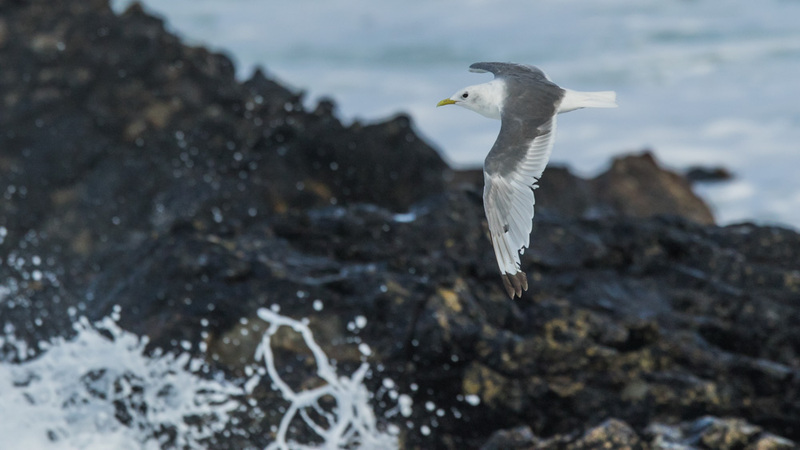 Kittiwake numbers in Britain and Ireland have declined by 63% between 1986 and 2014, but in some northern colonies like Orkney and Shetland, declines have been as high as 87% since 2000. In the Irish Sea, this decrease has been somewhat less marked, with small increases in some colonies even. 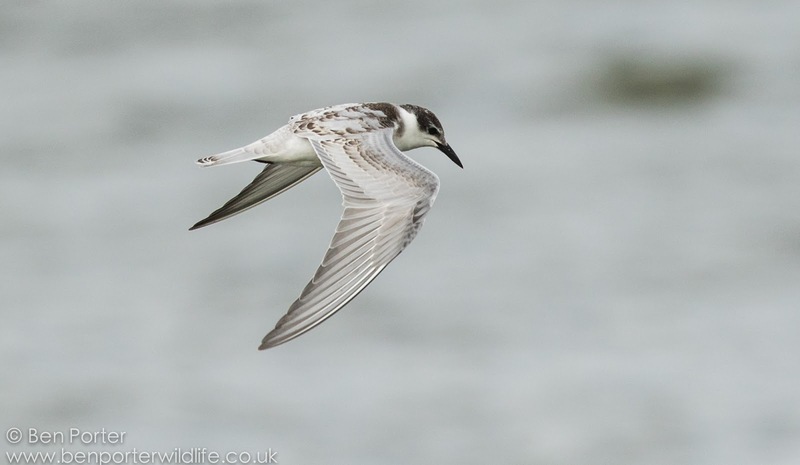 Here on Bardsey, the population has shown slight decreases in breeding numbers in the last few decades, but recent years have seen slight recoveries to our breeding population. Last year, for instance, saw a total of 125 nests on the East Side, which was a 20% increase on 2014, but a worrying 34.5% down on the 2006-2015 figure. Reasons for these declines could be multi-fold and complex: fisheries have impacts on the availability of their main prey - sandeels - and new evidence is suggesting that climate change and associated changes to sea surface temperature represents a real driver to the Kittiwake declines too: the changes to sea temperatures is causing declines and changes to plankton populations, which is the main food source for sandeels. Riding the change up the foodchain, and you have a domino effect. 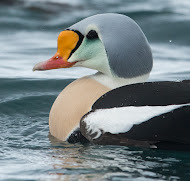 It's really sad to read the figures and hear about these declines - but monitoring populations, and contributing to studies such as colour-ringing projects like this one can help to understand more about the feeding behaviour and distributions of this species' populations both during and outside of breeding seasons. 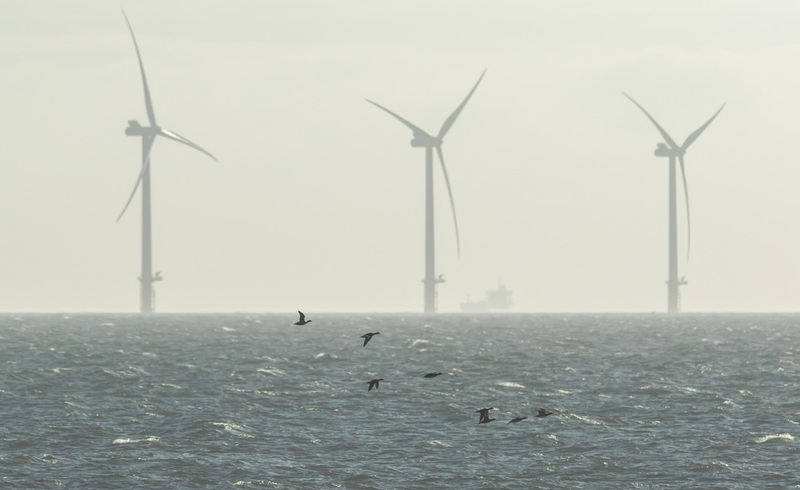 This can then inform governements and fisheries on where the most important areas are for this species, perhaps resulting Marine Protected Areas in some places to at least give the Kittiwake a hand whilst we tackle the bigger issue of our changing climate.